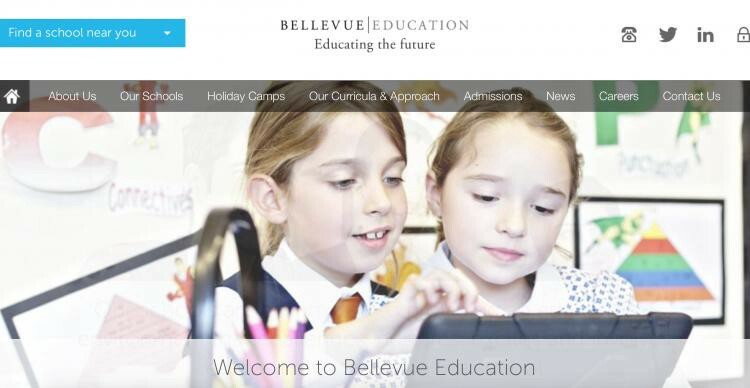 The Bellevue Education Group, previously named The Really Great Education Company Limited, is officially run from Geneva, although its UK registered company address is the PetroSaudi headquarters in Curzon Street. In fact, the business is primarily owned by two vehicles named Plato One and Plato Two based in Hong Kong, which are in turn controlled by Mahony together with an off-shore company owned by Obaid called Maplehill Property (BVI). The revelations will be an embarrassment to the high profile educationalist, Mark Malley, who set up the company, after what he claims was a highly successful stint as a headmaster, turning around failing schools. 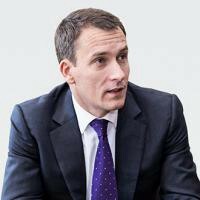 He is the Chief Executive of Bellevue Education Group and owns shares in the fast expanding venture, which plainly seeks to cash in on a perceived burgeoning market for private early years schools in and around London. The re-structuring and re-branding of Bellevue took place in late 2010 after a major initial injection of five and a half million pounds from the new secret investors, who engaged Marwan Naja to represent their interests, according to documents obtained by Sarawak Report. The two PetroSaudi directors agreed to make available more cash when needed to expand the project and we have evidence they raised over £20 million (RM110 million) in share capital and lending over the course of the next few months. The cash flow became available not long after both men received large sums of money directly into their private JP Morgan Suisse bank accounts from the now fugitive Malaysian businessmen Jho Low, which was termed as a payment for their role in “brokering” the billion dollar 1MDB PetroSaudi joint venture in September 2009 — from which Low siphoned out US$700 million into his private company Good Star Limited. Tarek Obaid received US$85 million in this initial backhander, of which bank accounts show US$33 million was passed on to Mahony. Neither man had been previously wealthy, however the injection of a further US$300 million into their company PetroSaudi, combined with further later backhanders from 1MDB via Low transformed their fortunes. Sarawak Report has already reported how, within a month of receiving his pay out for ‘fronting’ Jho Low’s theft from 1MDB, Mahony had bought a £6 million town house in London’s swanky Notting Hill. 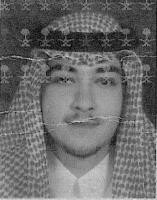 Tarek Obaid, was transformed from a cash hungry youth in Geneva to the head of a ‘philanthropist family foundation’ by his involvement in the 2009 PetroSaudi heist. He went to considerable lengths, hiring advisors and setting up another set of complex off-shore companies, in order to register the ownership as ‘non-domicile’, thereby to again avoid paying tax. The money has, of course, been lost to Malaysia’s own development opportunities, in the name of which these public funds were originally borrowed. 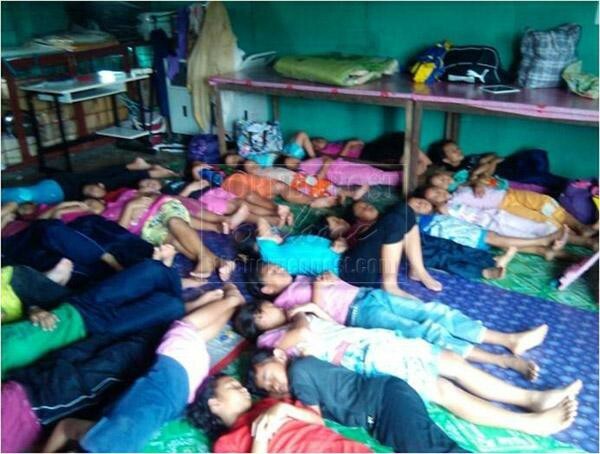 Sarawak, which faces a state election at the end of the month, still suffers from an appallingly low education provision for its indigenous rural communities, many of whom are forced to send their very young children to boarding schools, situated days away from their homes. The shocking conditions of these premises and low educational attainment of pupils has been a constant issue, which the BN government has for decades promised to address, particularly at elections — however, the money has always disappeared. The irony will not be lost on these communities that in this case Malaysia’s development cash has been invested in further milking the parents of privileged western children, by the tax evading ‘entrepreneurs’, who stole it together with crony political operators, including Jho Low. Documents, which Sarawak Report has passed on to British crime agencies, clearly show the covert methods used by Mahony and Obaid to privately invest stolen millions in a promising education business in the UK, while avoiding tax. 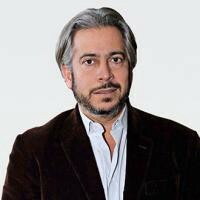 Managing the operation was Marwan Naja, who had left his position as private equity manager at the Swiss private Pictiet Bank in order to concentrate on his own private investment business Manixer in 2010… an interest he had apparently run in parallel to his official banking role for over a decade. His close links with PetroSaudi are illustrated by the fact that his office for this company resides in the very same building as PetroSaudi’s office at 86 Rue du Rhone in Geneva. 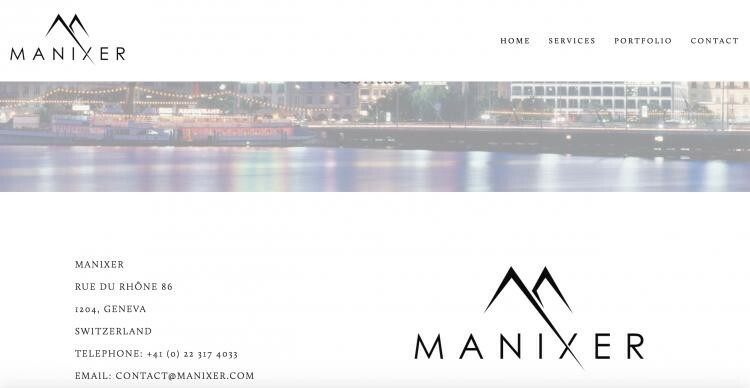 The connection with the actual investors behind this company Chairman is further emphasised by the fact that Bellevue’s London office is registered at PetroSaudi’s 1 Curzon Street address in Mayfair. Patrick Mahony is also listed as a Director of Bellevue Group in the UK company records, along with Malley and Marwan Naja. The documents setting up the private investment deal between Malley, Marwan and PetroSaudi show that Marwan used his former Pictiet Bank as the vehicle for launching the arrangement in Hong Kong. First the bank set up a Hong Kong company called Mercer & Spring, in which Naja held one share. Then it established a wholly owned Hong Kong subsidiary named Plato One, in which Obaid and Mahony were invited to invest. British company records show that Plato One is a shareholder of Bellevue Education Group International Limited, which in turn is the owner of Bellevue Education Group. 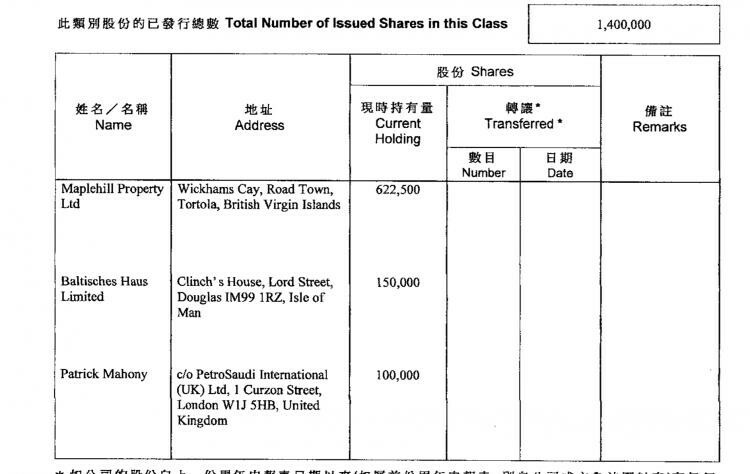 Bellevue Education Group International Limited — slice of the shares for Malley but who owns Plato One and Two? 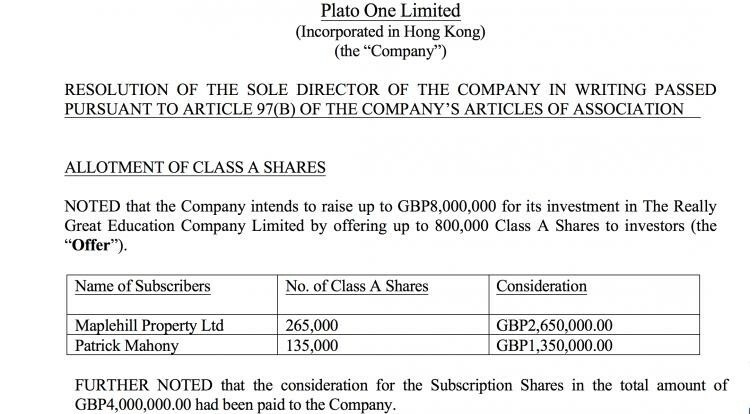 Research by Sarawak Report shows that shares in Plato One were offered to Mahony and Maplehill property group at £10 each on the basis Plato would acquire a share of Mr Malley’s company. Maplehill (Obaid) subscribed to around 2/3 of these for £2,650,000 — Mahony took the rest. The eventual investment in the then Really Great Education Company, at that point 100% owned by Malley, was projected to be £8 million according to the proposal put forward by Naja. Emails from Marwan Naja seen by Sarawak Report show that a further £1.5 million was raised less that a week later to invest in the venture. By the time Plato Two was incorporated in November 2011, the two investors were ready to buy in deeper, investing no less than £15 million in the venture, according to the articles of association of the company and a resolution made at PetroSaudi’s Mayfair Offices. The majority of the money was put in by Tarek’s Maplehill Property (see above). Another £15 million invested in UK private schools. 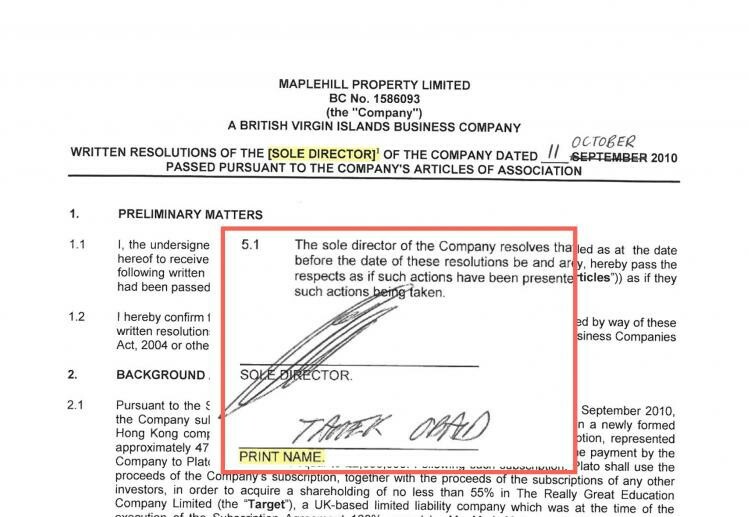 There is no doubt as to who the sole shareholder and director of Maplehill was at this time, because he signed a resolution for the company on 11th October 2010 in his capacity as sole director and shareholder, agreeing to the investment in Mark Malley’s eduction company. 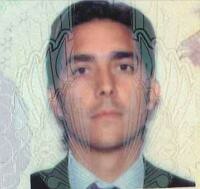 However documents and emails from the PetroSaudi database show that the investment was done through the London office of that company using PetroSaudi staff and lawyers. These revelations about owners of Bellevue and their stolen cash is likely to spark further concerns over a controversial acquisition by the company of a former state school premises in London, which has been backed by the Department of Education in London, but which campaigners say has taken away potential funds from less privileged state education facilities. It seems that even in the UK, Mahony and his fellow thieves are using their illegitimate gains to disadvantage less privileged children, in order to make themselves richer.